That’s what I hear from Top Gun every time I tell him that we are having Chinese food for dinner. Seeing the excitement on his face always make me smile and feel happy that I’m making his favorite dishes, and that he has an adventurous palate and likes a wide variety of foods. Mu shu pork is a traditional Northern Chinese dish that has gained a permanent spot on menus all over the United States. 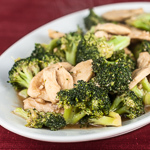 The combination of hoisin sauce, soy sauce, and sesame oil gives the dish a pleasant sweet/salty/toasty flavor. 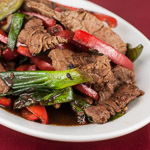 This mu shu recipe that I adapted from Cooking Light comes together in about 30 minutes, making it a good weeknight meal as well as a good party appetizer. The lettuce or cabbage leaf wraps reduce the calories and give a nice crunch, as well as the added bonus of even faster prep since you don’t have to make the pancakes. In the bowl, stir together the soy sauce, sesame oil, hoisin sauce, and cornstarch. Add the pork, carrots, and mushroom and stir until coated. Allow to stand for 10 minutes. Pour half the oil in the wok and heat over medium-high heat. Add half the onions and stir-fry for 30 seconds. Add the bean sprouts and water and stir-fry for 2 minutes. Transfer to a medium bowl. Add the remaining oil and warm. Add the remaining green onions and garlic, and stir-fry for 30 seconds. Add the pork mixture and stir-fry just until the meat is cooked, about 3 minutes. Add the bean sprouts mixture and stir. Serve about 1/2 cup of mixture in a lettuce leaf. 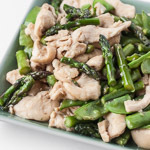 Traditional recipes have wood ear mushrooms and dried daylily blossoms, aka golden needles, but this recipe uses widely available white mushrooms. If you want to use golden needles, you can find them at well-stocked Asian markets, just add about 8 to 10 to the wok. The original recipe serves four, which isn’t enough for our family, so I double it. 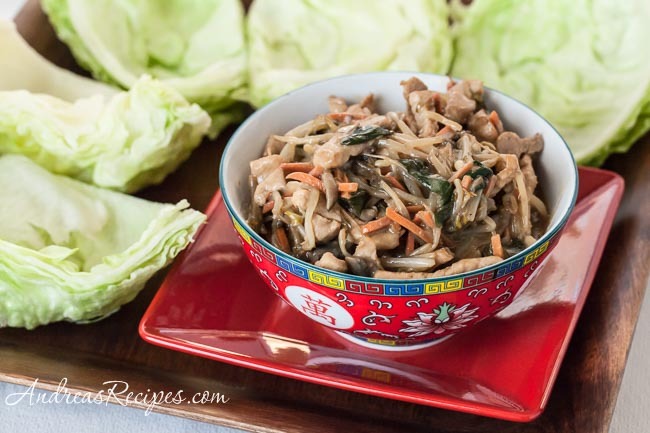 I always liked Mu Shu Pork and I adore the idea of eating it in lettuce wraps!